Been in a Auto or Truck Accident? Act Fast. Why is it important to hire an expert Newark Car Accident Lawyer? The Law Office of Fredrick Schreck filed and settled an automobile accident lawsuit for $575,000. The car accident victim was traveling on the George Washington Bridge when a van trying to merge from the left struck his vehicle on the driver's side. The client injured his lower back which required a lumbar fusion and epidural injections. The victim was also deemed totally disabled by the Social Security Administration. To help facilitate the settlement an economist was hired to give his prognosis on future lost earnings. A car accident is a very serious matter. After an accident, clients typically have many questions, such as what medical treatment is covered by insurance and lost wages are recovered. Also clients want to know what they have to prove at trial. While answers will vary in every case, after an accident, it is important that you file a police report and contact a car accident attorney immediately who can answer your questions. How do I determine if I am entitled to compensation for my injuries? How much money are Newark car accident victims entitled to for their pain and suffering? Auto injury victims often have questions regarding how much money they are entitled to for their pain and suffering. Each car accident settlement and case is different. 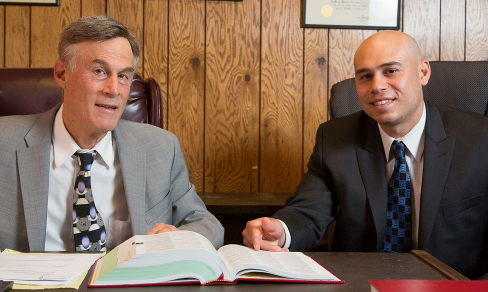 The attorneys of the Fredrick Schreck Law Firm gives personal attention to every matter including meeting with the client and thoroughly reviewing of all medical records. The auto accident lawyers will fight for your rights, to ensure you receive a fair car accident settlement for your personal injuries. Have you been injured in a Newark car accident? Newark is a very dangerous city and many people are victims to others' reckless and negligent driving. There are many busy and dangerous intersections, such as Broad Street and Market Street. Newark also has dangerous highways, such as Route 280 and Route 21. What additional evidence should I have if I'm thinking about suing for a car accident injury? Although it is not required, it is very helpful after an accident to take pictures of your vehicle as well as the adverse vehicle to show the property damage from the accident. Also take pictures of the intersection after the accident. Although this is not required, a picture may be helpful in maximizing your auto accident settlement. Every attorney has a different opinion on a case. While one attorney may not think that a potential client has a case he can recover on, a different attorney may want to take the case. I have recovered thousands of dollars for clients after other attorneys refused to take these case. Even if another car accident lawyer has decided you do not have a good case, contact the Schreck car accident law firm for a consultation, and we may be able to recover money for you. At the Law Firm of Fredrick Schreck, our highly competent Car Accident attorneys will fight for your rights and ensure that you will receive a fair settlement for your Car Accident case. "For the past 30 years, Schreck Car Accident Lawyers have been assisting injury victims get fairly compensated for their pain and suffering. Proven history will aid your recovery and get you the maximum settlement."